Australian born Michael Bayly is a leading spokesman for the local (Minnesota) gay Christian community. He serves as the executive coordinator of the Catholic Pastoral Committee on Sexual Minorities (CPCSM), the editor of The Progressive Catholic Voice, and co-chair of the Minnesota-based Catholic Coalition for Church Reform (CCCR). Earlier this year when an international group of progressive Catholic bloggers decided to collaborate on a new blog called Open Tabernacle, a pair of Minnesotans, Michael and I, were invited to participate. We are the Church. In our understanding of Church, all the baptized are one big community of smaller communities, we are all equal, we all participate in different ministries (lay, clergy, bishop), we communicate with one another, and we share a vision and a self-critique. The five words we have been using to summarize this model of Church are community, equality, participation, dialogue, and prophecy. It is a model arising out of Vatican II and seems to us most in line with the Gospel message. It has been promulgated by the Asian bishops and it also fits well with the positive values of our U.S. culture. A local chapter, Dignity Twin Cities, was formed in 1974. Initially accepted by the local Catholic hierarchy, the organization was eventually booted out of Catholic property and now holds its liturgies and meetings at Prospect Park United Methodist Church. The Rainbow Sash movement is associated with Dignity. The current president of Dignity Twin Cities is Brian McNeill. The Roman Catholic Womenpriest movement is small but energized, and I have blogged previously about the women who challenge the patriarchal Catholic hierarchy at the cost of excommunication (here and here). Roman Catholic Womenpriests reject the penalty of excommunication issued by the Vatican Congregation for the Doctrine of Faith on May 29, 2008 stating that the women priests and the bishops who ordain them would be excommunicated latae sententiae.” Roman Catholic Womenpriests are loyal members of the church who stand in the prophetic tradition of holy obedience to the Spirit’s call to change an unjust law that discriminates against women. Our movement is receiving enthusiastic responses on the local, national and international level. We will continue to serve our beloved church in a renewed priestly ministry that welcomes all to celebrate the sacraments in inclusive, Christ-centered, Spirit-empowered communities wherever we are called. Bishop Regina Nicolosi of Red Wing, Minnesota is a leader of the national Womenpriest movement. Regina Nicolosi, MA, was born in a small town on the Rhine River. She was a teacher in Germany. 1969 she came to the USA to marry the love of her life, Charles, a radiologist and deacon. Together they raised four children, one of them from Colombia and one from Korea. Regina participated fully in Charles’ preparation to the diaconate. She earned her Masters Degree in Pastoral Studies. Regina has worked as a housing manager for seniors, as a chaplain in a correctional facility for boys, in a drug and alcohol recovery unit and in a nursing home. She is retired now. She helps prepare women for ordination and celebrates Eucharist with Dignity and other small faith-communities. On Thursday, June 24th, I met Michael, Brian, Bishop Regina and other leaders of the progressive Catholic movement in Minnesota at a gay pride mass held in south Minneapolis. Following the liturgy, I was honored to be the guest speaker at this gathering of committed, Catholic, Christians. Michael’s personal blog reports on the events of the evening in his post entitled LGBT Catholics Celebrate Being “Wonderfully Made”. Click on the link to Michael’s blog for many pictures and Michael’s excellent reporting of this event. 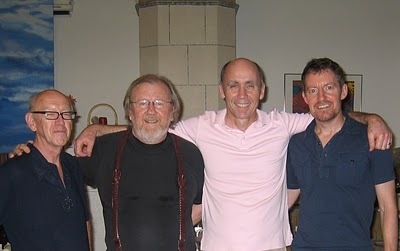 From left to right: Art Stroebl (event coordinator), Obie Holmen, Brian McNeill, Michael Bayly.